Downtown Kennett, California. Notice the “Meat Market” sign in the center building. photo courtesy of the Bureau of Reclamation. In 1944, the Bureau of Reclamation closed the gates at Shasta Dam and began inundating the vast network of valleys in the Shasta National Forest. In the valleys resided three unique cities, a fish hatchery, and thousands of residents. It may not compare to the estimated 1.9 million people displaced by China’s Three Gorges Dam project — a project that is five times as large as the Hoover Dam. However, it was an important location in the West’s history. Some of the largest copper mines resided in the mountains around Shasta. The largest of which was not consumed by the waters of Shasta Lake: The Iron Mountain mine, between Shasta and Whiskeytown. Effluence coming from Iron Mountain has been professed to have a negative pH (the only known natural negative pH). It is more acidic than battery acid. Not only was there sulfuric acid, there were also smelters, used in the copper refining process. The process of refining copper released toxic smoke into the air. The hills were denuded within a 15-mile radius. The mountains looked like vast victims of a nuclear blast (but that’s a whole other story). 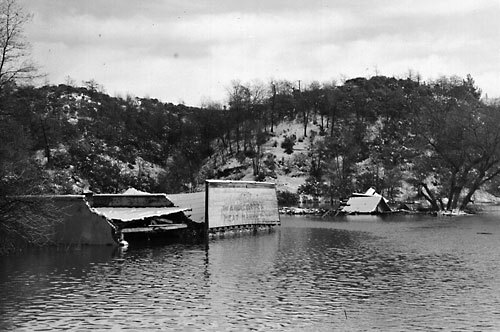 The point of this post was to talk about these inundated towns of Shasta (Baird, Copper City, Elmore, Etter, Morley, Pitt, Winthrop and the largest: Kennett). Kennett boasted a population of 10,000 — it had an opera house, trade stores, hospital, school, as many as 40 saloons, and more. 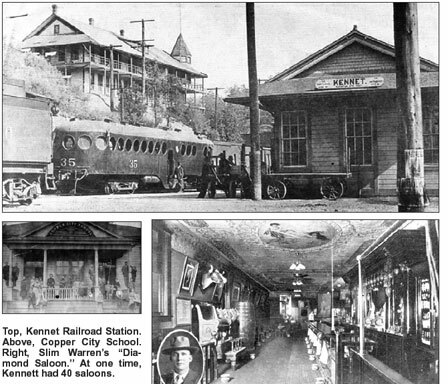 Kennett was a copper city that boomed in the early 1900s, especially during WWI. Slim Warren’s “Diamond Saloon” was known all across the state as an ornate and dazzling place to imbibe in alcoholic beverages. photo courtesy Shasta Lake Heritage & HIstorical Society. What does the story of Kennett tell us about Geography? I’ll let you decide for yourself. But one thing I find is that inundated towns tell something about the very real influence we as human beings have on the landscape. However much we may downplay our effects — positing that we are mere ants in the universe — we still have the ability to turn mountains into islands; cities into reefs. And as easily as we can submerge townsites, we can submerge history, never to look back. In the case of Kennett, we buried a place that became barren due to five copper smelters around the town — perhaps because we, as human beings, like to hide our ugly past. This entry was posted on Tuesday, January 23rd, 2007 at 5:43 pm	and is filed under Built Environment, Must See Geography. You can follow any responses to this entry through the RSS 2.0 feed. You can skip to the end and leave a response. Pinging is currently not allowed. I’m looking for info on Copper City. I am researching a murder that happened in Red Bluff on June 1, 1863. The accussed was a James “Poker Jim” Lacey. It was said that he ran a restaurant in Copper City about that time. Are there any photo’s from that time period of Copper City that you may know of? Thank You So much Carol! I love seeing things like this! There’s at least one of these in Colorado. The town of Montgomery was flooded by the creation of the aptly named Montgomery Reservoir. The reservoir now provides water to the city of Colorado Springs, and all that’s left of the town is its mill, high up enough to be safe from the water. We’ll take you up next time you’re in CO.
Jon, great post and nice re-design on the website. Do you think Kennett would be visible now that the lake is so low? Thanks Steve, Kennett is not visible now. The low point of Shasta Lake is about 400 feet underwater, so the lake would probably have to be literally emptied out in order to see the old city. However, I recently read a news story that indicated there are a few other mining towns recently revealed due to the low levels. Might be worth investigation. I know at the bottom of Whiskeytown Reservoir there was an entire steam engine discovered. Hey Andrew, would love to see the mill some day. I’m planning on a trip to Detroit for Memorial day this year, so I’m not sure when my next opportunity will arrive, but when it does I’d definitely love to see the mill. By the way is there any insight you have for me in regards to Gary, etc. Is there anyone i should be in contact with to give me tips for local sites? I was fortunate to publish Kennett: The Short, Colorful Life of a California Copper Town and Its Founding Family by Jane Schuldberg (Stansbury Publishing, Chico, CA, 2005, 224 pp., 51 illustations). I have a professional interest in the book, however even if I didn’t I’d recommend it to anyone interested in the history of Kennett, its surroundings, founders, and some of those who lived there. I am interested in the history of the Shasta area because my grandfather, father and uncle lived and worked in that area from about the 1860s until about 1900. My grandfather, Elias Prichard, came over from Wales and mined gold in the Wiskeytown area in the 1860s. He married and had a son, John Elias Prichard, who was born in Whiskeytown. My father, Robert F. Prichard (from Elias Prichard’s second marriage) worked at the Kennett copper mine or smelter in the late 1890s or early 1900s. So are there any records from Kennett or Whiskeytown regarding weddings, births, lists of the workers in the mines, census’, etc. If so, where might I find them? Other than that, I can’t help, but I wish you luck in your search! my grandfather was born in kennett ca i’m having a problem locating his birth records he was born thomas albert wheeler but was later adopted and his name was changed to thomas albert wilsey. can you please point me in the right direction. This is a fascinating story (and website). This particular story reminds me of the history of Quabbin Reservoir in Western Massachusetts. Five or six towns thriving towns were “removed” and the area flooded to create this massive reservoir. A few years back, a beautiful children’s book was writen about it. And back when I was in college, I visted the reservoir visitor center where once a week elderly former citizens would talk to guests about the experience of having ones town disappear. Fascinating stuff. Thank you for sharing all of this. Take care. I ran across your site while researching the titan silos here in chico, ca. and got stuck..you and your crew are very crazy…and fascinating. i have been here for hours reading of your adventures, admiring the great photography, and getting to know each of these places through some excellent commentary. i had the opportunity to enter the “missle silos” here in chico back in the ’80s..and that experience, actually seeing the ominous enormity, and sheer waste, left an impact upon me that will never fade. so hard to put into words. your documentation of the titan I base documented here is the next best thing to actually experiencing it. how about some of the subterranean tunnels and caverns that exist from the forgotten past in our cities and some towns? i understand the chinese, escaping extreme prejudice, and general mistreatment in the mid to late 1800s had a network of them under several cities here in northern ca. great work! great site! well done. I’m working on a documentary that includes the effects of the dam. Is there an estimate of the total number of people removed for Shasta Lake reservoir? Any source links would be helpful. Thank you. This is in response to Barbara Wilseys post on Sept. 7th, 2010 regarding Thomas Wilsey…If his Mothers name was Rose I may have some information for you since my Mother, Georgia, and Thomas were cousins. I would like to know the towns name way down on the bottom of Shasta Dam.. my dad worked on the dam as a oiler to operator &Cliff Grey. I got to ride down there just before the town was flooded, in fact they were getting ready to take the bar out of the tavern, name I don’t remember but it had silver dollar coins all over the top. then when we left the tiny town ,dad drove us up out of it on the old stage rout road.. oh my what a experience.. we mother & us three girls being from Illinois to Mts and all it was some to remember.. we lived in Boom town. would love to hear any inf on this also would love to hear about th stage coach road. I do drive teams of horses with covered wagons and did your senscintenial celerbration. would love to hear from you or any one on this waiting to hear from you. thanks. I’m curious: has anyone ever dived down with scuba gear and explored what’s left of the town? Also, do you know what happened to the graveyards? Did they relocate the bodies to other graveyards before flooding the town? Or did they just leave all the graveyards in place? Very cool. My grandmother was born there in 1915. Thanks for the pictures. Thanks for such an interesting article. I’m curious about the history of dislocation in the US due to dams and reservoirs, are there any books besides the Schuldberg listed above? My father was born in Kennett in 1914. I am trying to find information regarding his father, Martin Barthe and was wondering if there are any records of Kennett’s residents at that time. My Father-in-law Marvin H McLain, was born in Kennett, Jan 1918. He just past away in Nov, so he was almost 99. Thank you for posting the article just wish I would have found it before he was gone. I think they left by 1919. I think his father was a miner there. I did notice someone posted with the Last name of Hoxie, that was his mother’s maiden name, was wondering if you could be related? A couple years ago while camping on Shasta Lake in Lakehead, which is about a mile from the town of Kennett, i found, sticking out of the (then dry) bank of the lake what i thought was just a piece of metal, which after cleaning off a crust of red clay, turned out to be a sculpture of sorts, crafted from what appears to be a flat piece of mystery metal, folded and manipulated to look like an excited Bass fish out of water. (Note: Bass is my true given name). After 2 years of research and detective work, we have gained a good deal of knowledge of Kennett history and it is as though we personally know a few key players in the towns story. “Fish”, as we respectfully address him since having been teased by local businesses we ASSUMED should have more sense than to suggest we just “melt it down” for the precious metals, that it was just a piece of twisted metal, and actually said we must be taking pills or something…. , we weren’t, of course, and “Fish” is definitely a Fish! It has some seriously strange properties i dont dare bother the general blog browser with, but if you are interested or have some insight I would love to hear from you. We found “1886″ engraved in 2 places, the name “Golinsky”, (Charles), one of the founders of the town, “Diamond Saloon”, and of course “Victor E. Warrens”, the popular owner of the Classiest Saloon in town, and much much more. We visited the Shasta Historical society in Redding, where an employee confirmed the Name “Golinsky” engraved in it, proof we havent lost our marbles, but they had no information. My grandmother Leola Irene Vestel Wood Larson Murphy was born in Kennett Feb. 4, 1913. she was Cherokee native born on the reservation, adopted by Hiram Webster Wood and Mary Ina Vestel Wood. As a child she moved to Iowa with her adoptive parents. I am wanting any information on her adoption, her biological parents, also she has a sister. Please contact me on any records that you or I can obtain to this information. Thank you!